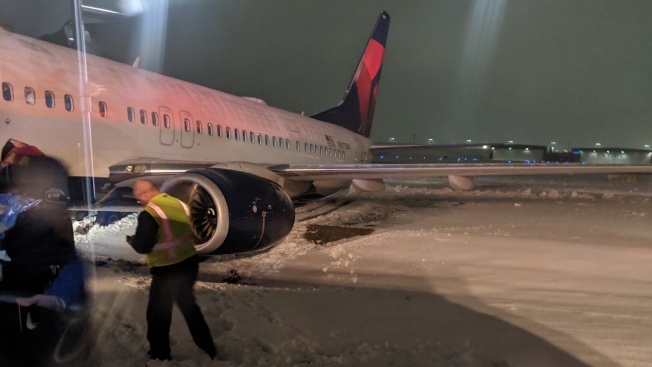 Delta Flight 1708 slid off the pavement while taxiing to the terminal at Cincinnati-Northern Kentucky International Airport. An airport official says a plane slid off the pavement while taxiing to the terminal at Cincinnati-Northern Kentucky International Airport, with no injuries reported. The Cincinnati Enquirer reports airport spokeswoman Mindy Kershner says a Delta flight from Las Vegas had safely landed at the airport in Hebron, Kentucky, around 5:30 a.m. Sunday. She said it left the pavement on its way to the terminal. Kershner said no injuries were reported on the flight that had 126 passengers plus the crew. The National Weather Service had declared a winter storm warning Saturday that remained in effect into Sunday morning as snow continued falling in the Cincinnati area. The winter storm contributed to at least five deaths in the Midwest and pummeled the mid-Atlantic region for a second day Sunday, bringing with it an icy mix that knocked out power, cancelled flights, and contributed to hundreds of car accidents. The airport said all passengers aboard Delta flight 1708 were transported from the taxiway to the terminal. Kershner says the airport remained fully operational.